While it is easy to be swept away by the seemingly endless torrent of nightlife that thrives here in Berlin, it is even easier to find your mind and body reeling from overindulgence. So trying to create equilibrium between work priorities, alcohol-fuelled hedonism and finding time to exercise the mind and body can feel impossible. So when I find the former two are outweighing the more important latter, I take myself to the yoga studios for some much-needed recuperation. Yoga is the perfect way to mix aerobic exercise along with flexibility training. But it is more than just a physical exercise. As you progress through positions, the regulation of your breathing creates an internalized rhythm in the body. The more you can engage and focus on the body’s flow, observing the repetition of the movements; you begin to gain mastery over the bodily senses. This undulating ability to be able to exert governance over one’s mind and body are responsible for the sense of calm felt while practicing yoga. It is a means to create and strengthen the connections between mind, body, and soul. Within the umbrella term ‘yoga’, there is a multitude of different styles, classes, religions, and philosophies. Whether you favor the flow and rhythm of Vinyasa, the control, and power of Ashtanga, or the relaxation of a more meditative class, there is something for most people. So once you have found a style that suits you, the next most important factor would be finding a teacher or studio you connect with. Generally, I like to schedule my classes around some basic guidelines. If my life balance has been overly hedonistic and orientated towards late nights then I will attend a more difficult Vinyasa class. With more of an onus on physical energy and flow, I can attempt to sweat out the innumerable units of alcohol I’ve consumed in the previous 48 hours. If however, and in the unlikely circumstances, that I have allowed myself to be consumed by work commitments, then I change tact; I aim to take more meditative classes. This allows me to cleanse my mind and re-enter a more stable and balanced headspace. So with that in mind here is a selection of studios and drop-in classes in Berlin that are taught in English. Yellow Yoga boasts two studios here in Berlin, one in Neukölln and this one in Kreuzberg. Situated just off of Oranienstraße, it is the smaller of the two studios, yet has a variety of brilliant classes on offer – most which are taught in English. With a class rating system from Beginner (rated ‘A’) to a more advanced (rated ‘C’) you can find a level which best corresponds to your ability. On a Sunday evening when you may be battling a weekend of debauchery, tear yourself from the couch and onto the yoga mat. With a voice that could calm a rabid dog, Imke takes you through a gentle Vinyasa class with considerable attention on deep relaxation and meditation. Yellow Yoga’s other studio, on Sonnenallee, is considerably larger and with better facilities. There is an impressive reception room that allows an opportunity to relax after classes, drink green tea and interact with the fellow Yogis. Classes to watch out for: Sunday 7.30pm, Naama – Vinyasa (level B): If your weekend has been peppered with equal parts of work and partying, then this is the class for you. A difficult level B class will see your work through Vinyasa at a high pace. Don’t be fooled by the light introductory meditation, things rapidly accelerate. Before you know it you will be fighting for breath, trying in earnest to let those fatigued muscles take a break at each momentary Downward Dog pause. If you are looking to kick-start the week with yoga then this class would be the obvious choice. Every Monday at the Buddhist center Anya runs two classes, one beginner, and one intermediate. The setting is fantastic with immaculate facilities and a comfortable studio with its very own centerpiece Buddha. Classes to Watch out for: Anya takes both the beginner level and intermediate classes at Buddhistisches Tor. They are without a doubt the best Vinyasa classes I’ve had in the city. With an almost omnipresence in the studio, Anya makes a strong connection with the class and evokes a powerful energy within the room. The ebb and flow of the Vinyasa reverberate in the psyche long after you’ve left one of her classes. Holistic Yoga Berlin, the product of Ewelina, gives way to a more inclusive and personalized yoga experience. Twice a week she opens her doors to small group sessions each with a different narrative. Inside this small studio with high ceilings, scents of lavender punctuate the air that is laden with light ambient music. The experience is far more involved and personal than the larger studios, and you certainly feel the benefits. 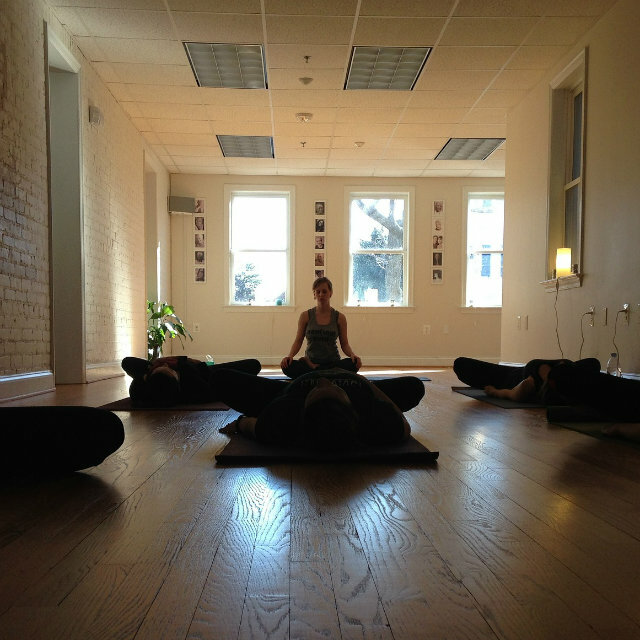 Classes to watch out for: Ewelina has an excellent Chakra healing class every Wednesday at 8pm. Positions are limited so it is best to reserve a spot in advance. Each practice looks into one of the seven Chakras with the aim of restoring it to its former glory. As you are initiated with a light mediation the class progresses into a more Hatha-orientated style, with particular stress on the selected Chakra. Expect to be feeling calm and restored after attending the session. So with a plethora of different studios and classes here in Berlin, why not break the cycle of your week with a drop-in yoga session? All the classes here offer you the chance to try it out without having to form a binding contract. This will allow you to locate the correct style and the right teacher that best connects with you. So shift the balance of your commitments and allow a little time each week to focus on the self.